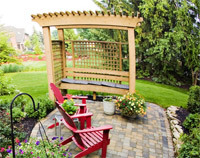 If you wish to upgrade the look of your outdoor area, we strongly recommend adding decks and pergolas. These outdoor amenities are meant to complement existing structures in your landscape, such as pools, patios, walkways, and the like. Additionally, they are designed to provide comfort, safety, and aesthetic boost to your outdoors. Simply put, they are among the wisest investments and upgrade you could ever have, and we have the tools, expertise, and manpower needed to create them for you—on time and within your working budget. We don not just design and build outdoor structures. Our pool decks are made of premium pavers or stones and are carefully installed by our ICPI-certified masons and paving stone installation experts. 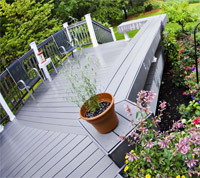 This ensures that the deck that we will design and build for you are built by the same people who have created outstanding outdoor living areas for countless other clients. Meanwhile, our viewing decks are likewise built by the same skilled people so you are also assured of a top notch viewing deck that your family and guests will appreciate. We can also install similar structures in other areas of your property. These are one-of-a-kind creations that you will enjoy for years and decades to come. Another of our expertise is in designing and building stunning pergolas that are as functional as they are beautiful. They are meant to provide shade during the day and protection at night. These structures can be built as stand-alone structures or be installed over decks or outdoor kitchens. They can be fitted with lighting fixtures, ceiling fans, and other amenities that will make your stay comfortable. Every shade structure that we build is handled by our team of skilled artisans who have already worked with hundreds of successful projects before. This is our assurance that your pergolas will be built using durable materials and quality craftsmanship. As certified professionals in our field of industry, we have the perfect combination of complete and appropriate tools and equipment, skilled manpower, and dedication to provide total client satisfaction. With these traits, every client can look forward to enjoying the many benefits that our decks and pergolas provide. So call us today or send us an email to inquire about the functional and stunning outdoor living spaces that we can create for you! We serve Newnan and other cities in the State of Georgia.